I'm sure a number of you are curious as to what's been happening in Grey and Cristy land, specifically an update on the Beats. So before I delve into today's post, wanted to share an update: the Beats are home!! It's been two weeks since the entire family was discharged from the special care nursery (miraculously enough, both Beats were ready to go on the same day), making it a month total that the Beats were in the hospital. The hospital staff still talks with amazement with how well they did and how quickly they progressed during that time. And that car ride home is one that I will never forget. Since being home, we've been focusing on establishing something of a routine, juggling feeding schedules with sleep, cleaning, getting somewhat nutritious meals and keeping the chaos to a dull roar. Needless to say, in the moments that we think we've got it down, a new curveball is thrown our way reminding both of us that there's still so much to learn. But with the failures comes the moments that I will forever treasure, holding fast to those smiles, giggles, looks of wonder and all the milestones. Since being home from the NICU, I've been thinking a lot about the whole experience. On one end, not really knowing what to expect was somewhat of a benefit as we went in with zero expectations for the entire process. But on the other hand, having some idea of what we were getting ourselves into would have been useful, as it would have attenuated some of the fear and uncertainty. So in the spirit of this other point, I've decided to write a survival guide for the experience. Keep in mind, this post is very much from one person's perspective and the care their babies received (specifically 32 week twins), so an additional advice or corrections would be greatly appreciated in the comments section. 1) Be open: This is by far the one advantage Grey and I had going into this experience. As I mentioned before, I had zero experience with NICUs prior to the Beats being admitted. Ultimately this turned out to be a good thing for us as it gave me nothing to compare to (which I am highly guilty of doing). Why this was important is that we were blank slates for the nurses and the care team, meaning that it was very easy to teach us how to care for the Beats while they were there. When we were transferred to the special care nursery, though, we found we had to reset our thinking and change our expectations. Luckily someone had warned us ahead of time that things would be drastically different between a level III NICU and a level II, so we were a bit more open. Still, that transition was hard as what I had come to expect wasn't what we were experiencing. And though the Beats progressed, I was only when I excepted that the situation would be different was I able to truly get with the program. My point is keep an open mind. Learn the policies and procedures for the NICU you're in and the care plan for your baby (babies). Don't be afraid to ask questions, but remember that one person's experience will most certainly be different from your own. 2) Integrate yourself with the care team: In other words, make a point of sitting in on rounds. Most NICUs I've heard of give parents this option yet too often many parents chose not to, instead choosing to remain in the dark with their child's care or waiting for the doctor to give them a summary later. I can't emphasize enough why you don't want to do this. Sure, rounds tend to be filled with jargon and it can be intimidating to be sitting with a group of people who have far more education than most of us ever will. But rounds is the time when the entire care team comes together to discuss the health of your child. Meaning that any pertinent information about how they are progressing, changes in their care or even recent hiccups will be discussed there. In addition, by being present, you'll get to know your care team faster. For example: rounds at the university NICU involved two dietitians, the nurse for the shift, the attending physician, the physical therapist/respiration therapist and up to 10 residents. Those residents were the ones who worked with the attending for delivering news about test results, changes in care and even answered questions, so if we hadn't sat in on rounds it's likely we never would have seen the attending physician. Sure, those first couple of days of rounds were intimidating, but it quickly became a time where both Grey and I could ask questions, plans for the day could be solidified and, most importantly, learn who to talk with about different aspects of the Beats' care. 3) Your nurse is your life-line: I can't begin to stress this enough. Outside of the fact that the nurse on duty is the one of the medical team who will probably have the most contact with your child for the day, there's the added benefit that these people are a treasure-trove of knowledge. Think of the world's best nanny with medical experience. Even though Grey and I got to know the physicians very well, it was the nurses that I credit the most for getting the Beats home so quickly and for teaching us a lot of the skills that we're still using at home. Grey actually joked about bringing all of them home with us as it became apparent that I would listen to them without argument. Did I always agree with them? No. But I also learned quickly that there was usually a reason they were doing what they were doing and, hence, it was to our benefit to follow their instruction. In addition, they were a great resource not only for clarifying medical questions/ modifying care (the physicians also listened to them too), but also for transition to the outside world. 4) Get involved: This is a general follow up with integrating yourself with the care team. I can't begin to tell you the number of babies I saw who didn't have parents during their time in the NICU. The nurses were amazing for stepping in and making sure that no infant in their care was neglected, but it was always met with sadness that the parents couldn't be bothered to be there and showed so little interest in their care. Part of this is likely due to the fact that there was a fear of failure/doing more harm than good. After all, your baby is in a fragile state. But it's important to remember that your baby needs you. Even if it doesn't seem like it. Hence it's important to swallow your fear and open yourself to failure and uncertainty. It can start with simply learning how to take your baby's temperature or changing their diaper (not an easy task with all those wires and tubes). It can even mean simply being present and reading to your baby through the isolette. As time goes on, it can mean Kangaroo care, helping with feedings and even learning how to read the monitors. Regardless, make a point of getting involved. *UPDATE: My Vegas pointed out that I need to clarify this point. I fully recognize that there are parents that are unable to be with their babies on a daily basic. At the university hospital, we encountered parents who came from as far away as Alaska for care and many of them could only stay for a short period of time before having to return. In addition, I met parents who had other children at home and because of work schedules/life were unable to be at the NICU. The thing is, even though these parents weren't always able to be physically present, they were certainly still involved. These parents would call daily, make a point of coming at the end of the day to drop off milk, and even set up a schedule to make the most of the time they did get in the NICU when they visited. This is drastically different from the mother who couldn't be bothered to spent time with her infant because she wanted to go clubbing or was more concern with making sure she got her "congratulatory shots" for having gone through child-birth. 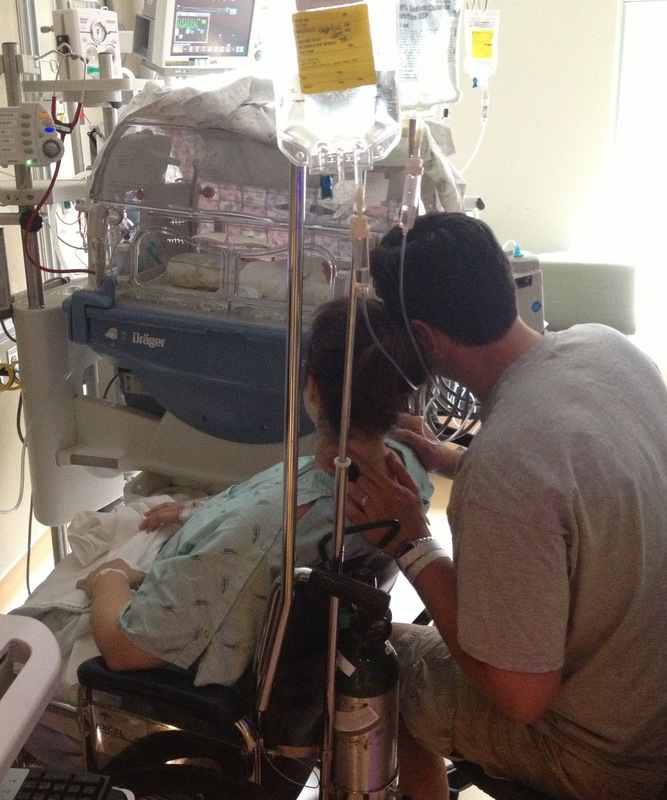 5) Don't live at the NICU: The above said, know that it's equally important not to live at the NICU. This one was hard for me, as I was convinced that if I wasn't there for the Beats 24/7, I was somehow failing them as a mother. I was concerned that I would miss something or not be there when they needed me most. The thing is, what I learned quickly (thanks again to the nurses) was that if I didn't give myself time to heal after my C-section and, equally importantly, didn't take the time I needed for my mental/emotional well-being, I would quickly become a burden to the Beats instead of a help. Leaving the NICU the day I was discharged to go home was so incredibly hard (and required a nurse intervention to get me to do so), but what I found was that by allowing myself to sleep, get my home in order, see friends/family and even get a few moments outside of the Vault allowed me to go back in refreshed, renewed and to be the mother the Beats deserved. So, as tempting as it is to live at the hospital, remember that it's important not to. Your family needs you to be healthy for the road ahead. 6) Celebrate the milestones: This was a valuable lesson I learned from my IVF experience. Yes, the ultimate goal is to bring your child home. But waiting to celebrate for that day is a recipe for unhappiness as it will seem like an eternity. Instead, make a point of celebrating each milestone for your family. For us, this started the day my milk came in. I still remember being in shock about getting hugs and high-fives over the increased production of one of my body fluids (seriously, my cervical mucus didn't get this type of attention). Some milestones we celebrated was the Beats getting their IVs out, getting He-Beat off of CPAP and later Hi-flow, them reaching their birth weights, the day the began the protocol to transition to open cribs, their transition to open cribs (ie "popping the top" of the isolette), them wearing clothes, eating from bottles, etc. You get the idea. Celebrating these milestones gave us hope and helped make the time pass that much faster. 7) Make your space your own: One of the first things I noticed when we entered the Vault was the homemade signs that hung from the door of each patient room. Not to be excluded, the nurses had made signs for the Beats the day they arrived, helping them act as identifiers for each patient. The signs were more than that, though. They became a way to personalize the space for each family, allowing for some sense of normalcy in an otherwise foreign environment. For some, your time in the NICU will be so short that you won't have time to really do much in the lines of personalizing your space. But for those with an extended stay, I really encourage you to ask what you can do. Most NICUs won't allow toys in the isolettes or cribs, but decorating the walls with family photos or pictures, bringing in personal blankets, clothes and even making signs are all things that can be done to make the area fell like an extension of home. Keep in mind anything that you probably don't want to bring in things that are precious or valuable, as it's not uncommon for things to be lost if incorporated into the laundry, but that shouldn't stop you from claiming your space. 8) Be prepared for the emotional crashes: Despite all the good that can come from one's NICU experience, the reality is that having a child in intensive care is a scary and emotionally draining experience. So don't be surprised if in the middle of all the good, you find yourself emotionally crashing. I can't begin to tell the number of times I lost it over seemingly small things. I still remember the day I cried for close to 4 hours after a less-than-minor incident. Not one of my prouder moments. The reality is, there are going to be moments where your world will crash down, so don't fight it or beat yourself up. Instead, do what you need to do to get through. In some cases, it meant calling it an early day and going home. In other cases, Kangaroo Care was the remedy for the situation. Just do what you need to do and don't for a second let anyone make you feel guilty for it. 9) Get support: On that note, know that you are not alone in this experience. Unlike infertility/loss, each NICU will have resources for you to tap into to get support for all aspects of your life. During the 4 weeks we were in the NICU, I spoke regularly with a social worker, met frequently with lactation and PT and even found support from the nurses. But the greatest resource came from the other parents. Prior to leaving the university, Grey and I connected with another couple we met in our twin course who delivered their twin boys just days after us (they were 30 weekers). They ended up following us to the special care nursery and occupied a space next to ours. The staff at the nursery loved the interaction we had with the other family, as we began checking in with their boys and the parents very regularly. In addition to this family, we learned about the parent liaisons, which were a group of parents who had graduated from the NICU who helped other NICU parents navigate the emotional aspects of the journey. Just having someone to talk with who "got it" made all the difference on some days. 10) Be selfish: Years ago, I had an opportunity to attend a talk about patient care for those battling cancer. One of the most shocking parts of the talk was when the speaker emphasized dealing with the emotional baggage of the patient's support system. More times than not, he stated, the patient will end up spending resources managing family members or friends who are struggling with the patient's prognosis. It's never done in a malicious way, but life traumas tend to bring out the worst in some people. Being in NICU won't exempt you from this. I had the unfortunate opportunity to witness this happen during our first days at the NICU, where a MIL was ultimately banded from the NICU after it became clear that her emotional baggage was hindering the parents from being able to care for their newborn son. I still remember the attending marching the dad into the social worker's office and explaining to him that he had to start dealing with the family dysfunction for the sake of his son. The truth is, as hard as it can be, the NICU is not the place for people to work through past traumas or their emotional baggage. Hence you may need to tell people that visiting the patient is not an option. Grey and I were fortunate in this regard as by the time the attending cleared the Beats for visitors they were also being moved to the special care nursery. Even then, we found that we didn't have time to accommodate visitors due to the Beats' schedule. Did I feel guilty? Hell yes! But I also know that if I managed other's needs, our babies would probably still be in the hospital instead of at home with us. So as much as it goes against your nature, don't be afraid to put your needs and your baby (babies) needs above others. And don't be afraid to ask for help in order to do so!!! After all, the goal is to bring them home. I'll end by saying that by no means are these guidelines hard and fast. Again, this is what worked for us and our children, but each experience is different. Still, I hope that by sharing some of these things others will find a smoother experience. And if there are additional suggestions or clarifications, please feel free to leave them in the comments below. Four years ago, while sitting on a balcony in Washington DC, Grey and I began a discussion about expanding our family. I remember the fear surrounding this decision, with Grey voicing his concerns about the gravity of such a decision and me fighting back tears over the fear that we would not even begin the journey because of those concerns. Ultimately, we did come to an agreement and the decision was made that November I would stop birth control and the end of December would be when we would begin the TTC process. Unbeknown to both of us at the time, that night would mark the beginning of a journey very few talk about openly. That as the months rolled by, we would find ourselves facing a disease that is marred with taboo and misinformation. During that journey, I've had my heart and soul ripped into a million pieces. I've questioned life and its cruelty. And even come face to face with a darkness/bitterness that is truly worse than death. It wasn't until this last year that I began to see the "benefits" of this life-changing trauma. Faced with the belief that our dream of parenthood was dead, I learned some valuable lessons. I learned I'm stronger than I gave myself credit for. I learned how to find hope in moments of uncertainty and pain. I learned that happiness is a choice and that no one can chose that path for me except myself. I've learned that a full life is not dependent on living according to the formula that so many in society push. That living with infertility and loss does not damn one for eternity and, in a strange way, can actually open the window to wonderful possibilities in life. And I learned first hand that if I want to destroy the taboos and stigma surrounding infertility and loss, I had to raise my voice and share my story without shame or apology. That by doing so, I could finally cure myself of the bitterness/darkness that had haunted me for so long. This past May, the theme for NIAW was "Join the Movement." 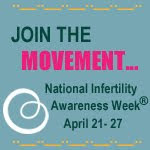 During that week, bloggers from all over the country (and even the world) wrote posts telling their stories and encouraging their readers to raise their voices to help change the conversation about infertility and loss. If you haven't had a chance to read these posts, I recommend you take some time to do so. The theme from each of these is clear though: ALIers are tried of being seen as taboos. And they encouraged all around them to begin challenging the taboos associated with these life-altering traumas. A few weeks ago, I received an email from Pamela Mahoney Tsigdinos. In her email was an announcement about an upcoming event she is organizing called "The Cycle: Living A Taboo" that addresses publicly the taboos surrounding infertility/loss. Pamela's post as well as Loribeth's post summarize this nicely, so take a minute to go visit and comment. In addition, though, I'm posting the letter that Pamela sent me along with her message. As many of you know, I'm part of a non-profit event organizing team. We're reaching out to personal networks to ask for help in spreading the word about an unprecedented all-volunteer effort to de-stigmatize infertility. We've created (below) a proposed letter for those we know to send out or to customize for blog deliver. We're particularly eager to get people in the NYC area to attend, but we also want to expand visibility for the effort largely as we think we can help spark a national dialogue that goes far beyond the event. Please feel free to customize for your respective audiences. I encourage you all to spread the word. Even if you can't attend the event, making it known is the first step towards change. So take a moment today to do so in your own way. Blog about the forum (and share a comment on Pamela's blog so it be linked to the event website), tweet about it (join or support #TheCycleLivingATaboo) or even simply send a copy of this letter to those closest to you. Regardless, now is the time to challenge the taboos surrounding infertility/loss. Now is the time to raise our voices for change; to begin the discussion that is long overdue. You are receiving this letter for one or all of several reasons: 1) You have been part of my personal history with infertility; 2) You know someone else who's directly impacted, or 3) You have an interest in being part of an unprecedented forum that raises awareness about emotional traumas, including societal impacts, risks and myths associated with infertility, childlessness and fertility treatments. On Friday, September 27, 2013 , in Lower Manhattan at the BMCC Tribeca Performance Arts Center Theater #2, "The Cycle: Living A Taboo" will convene patients, doctors, authors, filmmakers, and trauma therapists familiar with infertility and treatments for this long overdue public dialogue. The 90-minute program will include dramatic readings, film segments, and intentional conversations about stigma, hype versus hope, and trading losses in for life. The Cycle will be recorded and filmed; segments may be used in a documentary of the same name. Your presence as part of the audience or your support of this triumphant group is absolutely needed to mark the beginning of societal change in how we universally speak about this once taboo topic. Event co-producer and documentary filmmaker, Irina Vodar, collaborated with a team of medical and mental health professionals and patients to share their trials and triumphs, and ultimately give birth to a language that supports and offers compassion to those who live this taboo in silence. "We aim to challenge conventional wisdom and foster a new, more open dialogue about infertility," said Pamela Tsigdinos, co-producer and author of Silent Sorority. "Rather than remain silent, for fear of being shamed or judged, we will give voice to what has been a profoundly misunderstood and misrepresented human experience." Tickets are $30 through September 20; $40 hereafter. To reserve a ticket, please visit: http://www.smarttix.com/show.aspx?showcode=CYC3. Who Should Attend: People facing a diagnosis of infertility, those who have experienced fertility treatments—whether they succeeded or not––and those who have adopted children are welcome to attend this historic event. Organizers also invite friends and family members of people coping with infertility and those whose loved ones did not become parents after treatments failed. Also welcome are fertility doctors and nurses, representatives from the mental health community, including social workers, psychologists, and psychiatrists, and members of the media who interested in improving how they report on issues linked to this complex health condition. 199 Chambers between Greenwich and West Street To learn more about the Forum and the documentary, please go to The Cycle: Living A Taboo http://www.thecyclelivingataboo.com. On behalf of the Forum team I thank you for your support and presence on Friday, September 27.